Bad enough a leaked memo exposed the Toronto Sun’s secret plans for the Ontario election, now one of their star reporters is hosting an event about Ontario PC leader Doug Ford at a conference organized by a controversial far-right website. 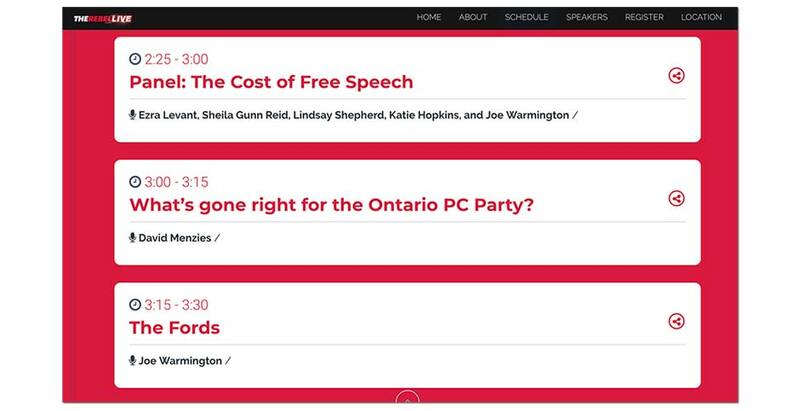 According to Rebel Media’s website, that includes a panel titled “The Fords” along with another panel featuring controversial far-right speakers. 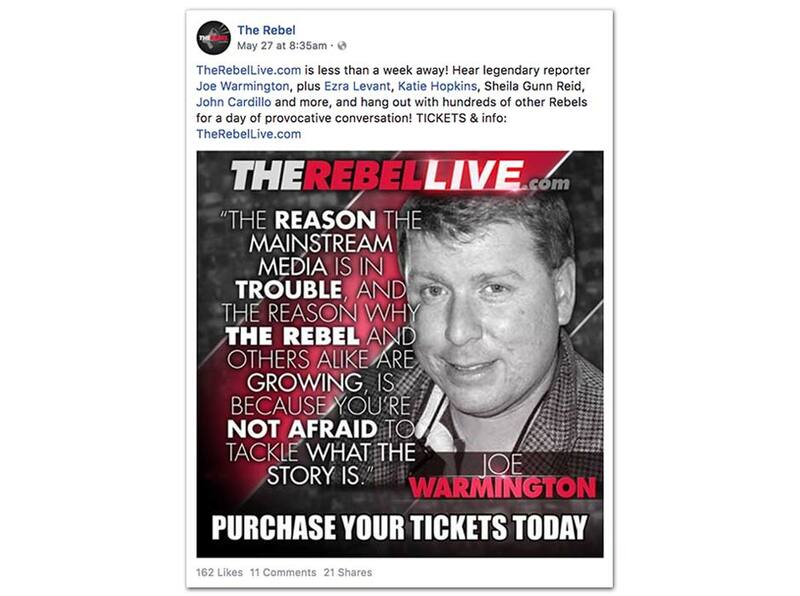 “Rebel Live,” which is billed as “the most provocative, most interesting and most conservative conference in Canada,” makes extensive use of the Toronto Sun personality in its promotional materials. Warmington, who once defended a Rebel Media host outed who appeared on a neo-Nazi podcast by calling her a “good kid,” is promoted in a video as the “Ford whisperer” for his exclusive access to Ontario PC leader Doug Ford. 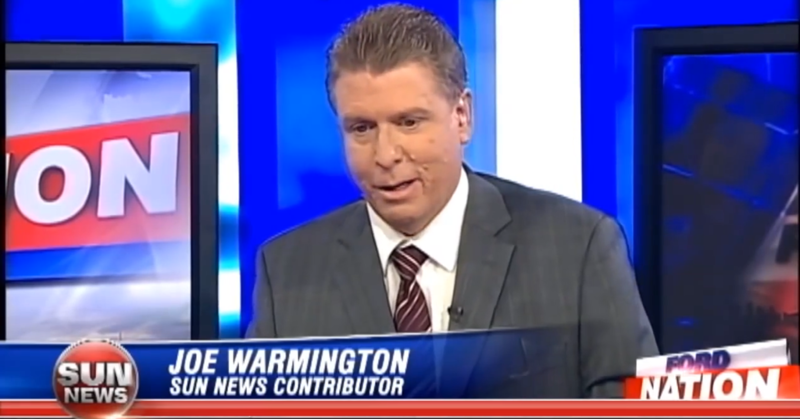 Memorably, the Toronto Sun reporter teamed up with Rebel Media owner Ezra Levant in 2013 to co-host Rob and Doug Ford’s short lived Sun TV show “Ford Nation,” which was cancelled after one episode. The “Rebel Live” event – hosted at Canada Christian College, an organization headed by Charles McVety, a homophobic Christian nationalist and a major ally of Doug Ford – includes a speaking roster that features a cavalcade of bigots and right-wing extremists. Hopkins previously made international headlines when she wrote a column for the British tabloid The Sun which called refugees “cockroaches” and called on British gunships to open fire on boats fleeing genocidal regimes. Unfortunately, this year’s Rebel Live event might not be able to top last year’s extravaganza, which featured none other than Doug Ford himself. Previously, Rebel Media owner Ezra Levant claimed media conglomerate Postmedia, parent company of the Toronto Sun, ordered its “talent” to stay away from Rebel Media following the website’s sympathetic coverage of a 2017 white supremacist rally in Charlottesville, Virginia. Does Troy Crowder seriously believe what he’s saying or is he simply grasping for straws to explain why so many voters don’t like Doug Ford? 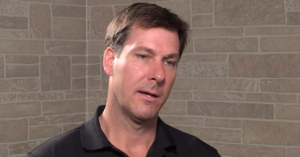 In an interview this week with local news site Sudbury.com, the ex-NHL enforcer turned Ontario PC candidate offered an elaborate and at times incoherent theory for why his party is struggling in recent polls.